Rising featherweight Tugstsogt Nyambayar (11-0, 9 KOs) remained unbeaten unanimous decision victory over Claudio Marrero (23-3, 17 KOs) in their WBC Featherweight Championship eliminator bout. 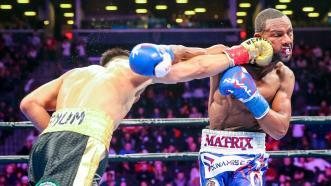 Rising featherweight Tugstsogt Nyambayar (11-0, 9 KOs) remained unbeaten with a narrow unanimous decision victory over Claudio Marrero (23-3, 17 KOs) in their WBC Featherweight Championship eliminator bout. 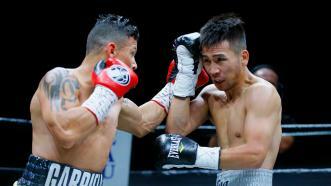 2012 Olympic silver medalist Tugstsogt Nyambayar defeats former title challenger Oscar Escandon by third-round KO. 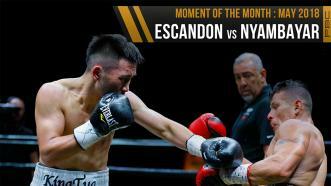 On May 26, 2018, Tugstsogt Nyambayar declared himself ready to face southpaw Gary Russell Jr., Leo Santa Cruz, Abner Mares, Josh Warrington or any current or former champion at 122 or 126 pounds following his five-knockdown, third-round knockout of ex title-holder Oscar Escandon in the co-feature of PBC on FS1 at Beau Rivage Resort & Casino in Biloxi, Mississippi. 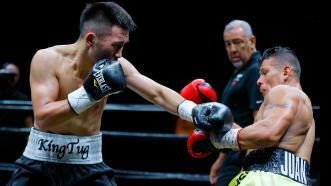 Tugstsogt Nyambayar improved his record to 9-0 by dropping Oscar Escandon 5x in three rounds en route to victory on PBC on FS1 May 26, 2018. 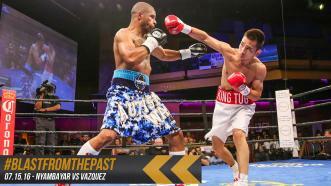 Blast From The Past — 7.15.16 — Tugstsogt Nyambayar made quick work of Rafael Vazquez. The 2012 Olympic silver medalist returns to the ring this Saturday night against former title challenger Oscar Escandon on #PBConFS1.